Illustration courtesy of the Lyman Products Corp. I have used a Lyman Electronic Trigger gauge for as long as I can remember. My original still works, but Lyman has improved it with their current model, the #7832248 Trigger Pull Gauge Electronic Digital. No longer do you screw on the pull extension, it handily collapses into the housing. The older Lyman pull gauge used a 9V battery, but this current version uses a pair of AAA batteries, which are included. "Lyman's revolutionary Digital Trigger Pull Gauge is designed to be the fastest and most accurate trigger pull gauge available. The state-of-the-art strain gauge technology allows for accuracy of 1/10 ounce/2 grams. The gauge will read to a maximum 12lb/5.4kg and features a large, easy-to-read LCD display. To operate, simply press the ready button, hook the roller around the trigger of your firearm and pull until the trigger releases. The gauge will display and hold the exact trigger pull weight. For a new reading, just press the ready button and repeat. The gauge will also give you an average of up to the last 10 readings. Switch from ounces to grams with the push of a button." You might wonder why you really need a trigger pull gauge? Mass produced guns have triggers that are often erratic. In the case of some older guns, such as the Browning Auto-Five shotgun, the triggers are metal and they were generally pretty good. I just grabbed one of my Belgium A-5 Light Twelves and the trigger breaks crisply at an average pull weight of 3 pounds 2 ounces. Unfortunately, the days of most off the shelf repeating shotguns, rifles or pistols having a 3-1/4 pound trigger pull are long gone. Part of the problem is the trigger groups themselves. Most are currently built on plastic frames, with most everything pinned in place. The plastic foundation can stretch or flex and factory adjusting triggers is hand work that costs money, so it is avoided. A good field shotgun trigger should be about four pounds; a good target shotgun, hunting rifle or handgun trigger should measure about three pounds, or less. All too often triggers release at a weight that exceeds the weight of the entire gun and modern semi-auto pistol triggers almost always do. If you carry your Lyman trigger gauge with you when you are gun shopping, you can save yourself the time and hassle of an aftermarket trigger job. Gun manufacturers often apply a generous amount of wishful thinking when it comes to their published gun weights. I have been told, on several occasions, that the reason my gun is 3/4 pound heavier than the published weight is "wood density." It is a pity that the factory comedian on the other end of the phone was oblivious to the fact that the gun in question was made with a synthetic stock. "A solid performing trigger is something usually reserved for rifles and seldom found on shotguns. You will, however, find one on the Maxus. In fact, we are so impressed with the new Lightning Trigger System in the Maxus, we think it might be the finest ever offered in an autoloading shotgun. The Lightning Trigger is designed to offer a smooth, crisp feel with minimal travel." It may be "designed" to offer a smooth, crisp feel, but none of the six or seven Maxus models I have tested were actually manufactured that way. While Browning may be "so impressed" with their own trigger, no one else is and I'm certainly not. It just creates more work for Precision Sports, or Cole Gunsmithing. Browning is hardly alone, as most manufacturers happily misspeak (lie) about reliability, recoil and everything else. As for who makes the "most reliable, fastest cycling, best handling, softest shooting shotgun/rifle/pistol in the world," well, everyone makes that model. Can't you read a catalog? Forewarned is forearmed and a Lyman trigger gauge can help you avoid buyer's remorse when it comes to trigger weight, safety weight and gun weight. It sells for about $47 at Amazon.com as I write these words (summer 2018). Editor's Note: Randy's article inspired me to order one of these Lyman trigger pull gauges, which was delivered in two days. I review many firearms every year for Guns and Shooting Online, in the course of which I measure a lot of trigger pulls. I have used an RCBS spring trigger pull scale for many years without any serious complaints, except that it does not read beyond eight pounds, which is not high enough to read some of the super heavy triggers found on modern firearms, particularly autoloading pistols. However, I am glad I have now moved into the electronic, digital age with this new Lyman pull gauge. It is easier to read, more precise in its readings and easier to use. The stated resolution is +/- 0.1 ounce from 0 - 5 pounds and +/- 0.5 ounce from 5 - 12 pounds. The 12 pound maximum weight is a big improvement, allowing me to measure most, or at least many, double-action trigger pulls. The memory feature, which can record up to 10 pulls and precisely averages them, is very convenient. Accurately measuring a trigger requires averaging several pulls and now I don't have to approximate an average in my head. The bottom line is this Lyman gauge is easy to use and super accurate. 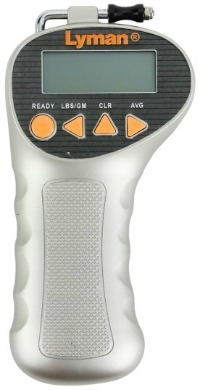 Thanks, Randy, for bringing the Lyman Electronic Digital Trigger Pull Gauge to my attention! - G&S Online Managing Editor, Chuck Hawks.